Does home buyers needs the speedy procedure for the execution of the RERA orders? CentrikBlogsBusiness AdvisoryRERA ConsultingDoes home buyers needs the speedy procedure for the execution of the RERA orders? The Real Estate (Regulation and Development) Act, 2016 is well equipped with all the provisions which have been helping the home-buyers to come out from all such chaos which they have been facing since they have bought the property. 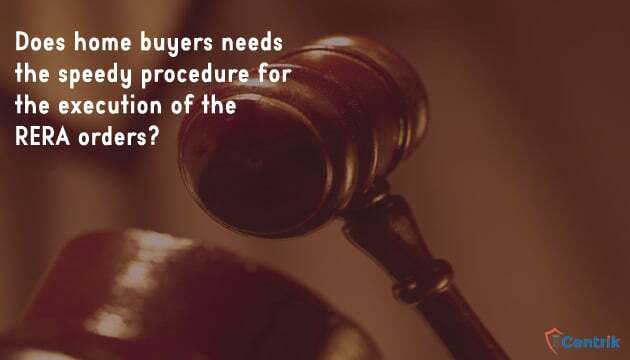 Now after coming RERA into force, there are such legal remedies, where if there is any breach in the terms and conditions of the builder-buyer agreement or delay in possession of the property then a home-buyer can directly approach to the RERA Authority to avail the legal recourse. Having said that, after the implementation of the RERA Act, we have witnessed numerous of judgements, wherein the aggrieved home-buyers have got the justice and got their money back but still the builder is taking advantage of the certain glitches of the RERA provisions. As per the RERA laws, a builder has to comply with the order within the prescribed time limit given in the RERA rules of the State or as specified in the order. And if it is not so then there are provisions of recovery where these arrears shall be recoverable as land revenue. In such procedure, a home-buyer needs to file the execution application as per the State regulations in the prescribed format and after the assessment of such application, the department shall issue a Recovery Certificate (RC) to the District Magistrate (DM) of the jurisdiction where the project is located. As Builder knows the complexity of the recovery procedure, the builders knowingly do not comply with the RERA orders to buy the time. In one of the similar cases, a home-buyer in Pune even have got the RC issued but still, his money has not been recovered. The reason behind this is that there is an accusation of Rs. 2091 crores economic fraud on the Builder and this has become the technical reason for the delay in recovery; there are so many instances where the execution of the orders are taking so much time without any reason and the officials do not have any answers for such delay. After considering all the provisions and current scenarios we can clearly conclude that there are certain amendments needs to be done when it comes to the execution of the RERA orders so that the purpose of the RERA can be justified.